Despite all our best efforts at spreading compassion and understanding, violence and hatred continue to affect our world, our country, and our communities. 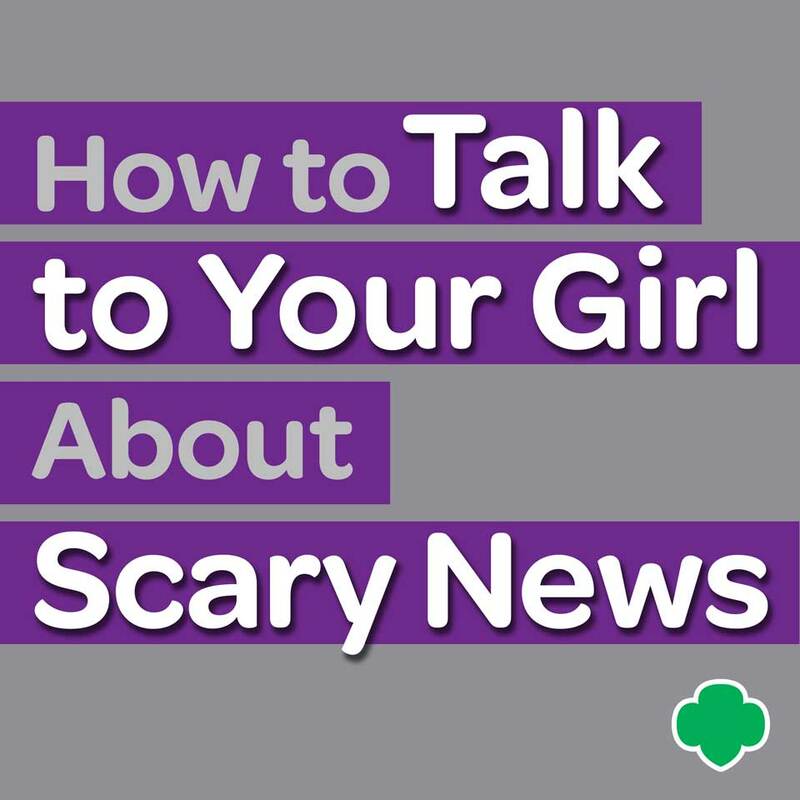 And in a world with a 24/7 news cycle, it’s hard for anyone—even children—to avoid hearing about frightening things when they do occur. Since news programs are produced with adult viewers in mind, and because images of violence and destruction can be hard even for us as grownups to wrap our heads around, the likelihood that these stories will cause anxiety and fear in children is pretty high. Still, even if you try to keep the news off when your kids are around, it’s unrealistic to think you can shield them completely. Knowing what to say to your daughter who is confused or upset by recent acts of violence can be difficult, especially when you’re still trying to process them yourself. If your daughter asks questions about a terror attack or other act of violence she’s heard about or seen on the news, you might be tempted to change the subject to something—anything!—else. But avoiding the topics on your daughter’s mind won’t help anyone. In fact, it could lead to her imagining an even scarier situation, wondering if she has upset you by bringing up this topic, and ultimately feeling more alone and frightened. Instead, listen seriously to what she’s asking you and do your best to give her limited but fact-based answers while staying as calm as possible yourself. Remember, your daughter is learning a lot about how to react to the world from you—so if you stay cool and collected, she’s more likely to as well. Political unrest, mental illness, and the inner-workings of a terror organization will probably be over her head, so keep it simple. Answer her questions in basic terms, and emphasize that for every one or two people looking to do something to hurt others, there are so many more who are working to put a stop to it—and that that’s the side your family and community are on. Avoid sharing your judgments or speculations about situations, as she may understand them to be true, and that could actually make her anxiety worse. Just remember: you don’t have to have all of the answers. It’s fully okay to admit that you don’t understand why something like this could have happened. She might be scared that something similar could happen to either herself or to your family members, so make sure to tell her that you love her and will always do your best to keep her out of harm’s way. Remind her of the many other caring adults in her life—in her family, school, and community—who are also there to keep her safe. If she’s already had practice safety drills at school, or will soon, reinforce the idea that those are done just in case something bad happens, not because it will happen (and, in fact, it probably never will). And it may sound crazy, but simply keeping her to her regular, consistent schedule and spending a little more time with her if possible can make a big difference in her sense of security. Finally, while you may be relieved when the conversation is “over,” do check in a few days later to ask how she’s feeling and ask if they’ve been talking about the topic at school. There’s no need to bring it up every day, but you don’t want her worrying all on her own or struggling with potential misinformation, either. After a person or a small group of people does something terrible, sometimes people irrationally distrust or make unfair judgments about other people who look a certain way, hold certain beliefs, or come from a certain place. If your girl has heard people express these kinds of negative stereotypes, explain to her that not only are broad statements about any one group untrue, they can also be incredibly hurtful and damaging. Discuss ways she can help fight stereotypes, like sticking up for kids who might be unfairly judged and refusing to join in on any hurtful jokes or rumors based on a person’s appearance or belief system. Remind her that enjoying our lives and being kind to others actually helps balance out the bad stuff in the world—and that turning to violence or fueling stereotypes about certain groups of people just adds to the problem. Team up to think of something you can do together to spread kindness and understanding. Maybe you can get some books from the library that can help you better understand other people’s cultures or donate some of her old books and toys to children in need. Taking action in your community won’t just make her feel more in control, it just might give you a little peace of mind in this chaotic world, too. 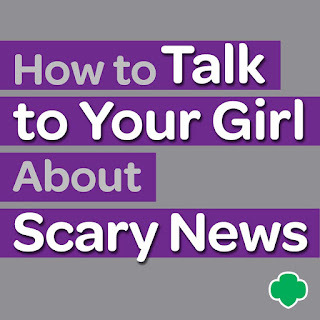 For more about how Girl Scout troops can help when natural disasters strike, click here. Looking for a way to get involved with Girl Scouts? Join, volunteer, or donate today.